The gateway to the NSW Snowy Mountains is booming, and Jindabyne, in the Deputy Premier’s seat of Monaro is seeing enormous amounts of promised investment. On Saturday the Deputy Premier and Member for Monaro John Barilaro, committed almost $70 million worth of infrastructure projects for Jindabyne if re-elected on March 23. Mr Barilaro said the plan would include analysis on the location of future services including schools, health services and community centres and redesign Jindabyne as Australia’s premier alpine destination. The plan also looks at links and opportunities in surrounding towns and villages including Adaminaby, Berridale and Dalgety. $10 million to upgrade and renovate the Jindabyne Police Station. “We are expecting the findings of the Go-Jindabyne masterplan to be released midway through 2019,” Mr Barilaro said. “We don’t want to see ad-hoc development roll out in Jindabyne. So let me make it clear that the NSW Government will not pre-empt the masterplan. “What I have announced today is the commitment and allocation to fund the first step of the Go-Jindabyne process. “I am particularly excited about the announcement of the education precinct. The $7 million TAFE and Country Universities Centre precinct has the potential to be co-located with a new high school, depending on the preferences released in the masterplan findings,” Mr Barilaro said. With the $40 million funding for future growth and development of Jindabyne Central School (JCS), Mr Barilaro raised the suggestion of relocating the high school component of JCS to Jindabyne Sport and Recreation. “The announcement of a new education precinct for Jindabyne gives the opportunity to re-address the location of the new public library I was proud to announce funding for earlier this year,” he said. 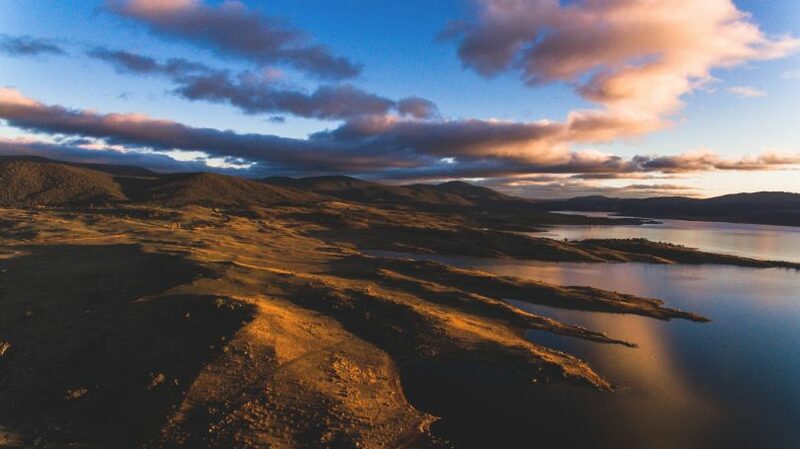 The $11.8 million allocation for the Jindabyne Shared Trail will link with the $9.8 million Thredbo Valley Track Extension and create an international standard mountain bike trail. In the run of election announcements, the Nationals leader has also announced $20 million to seal Bobeyan Road, which is the shortest route from Canberra to Adaminaby and the snowfields. 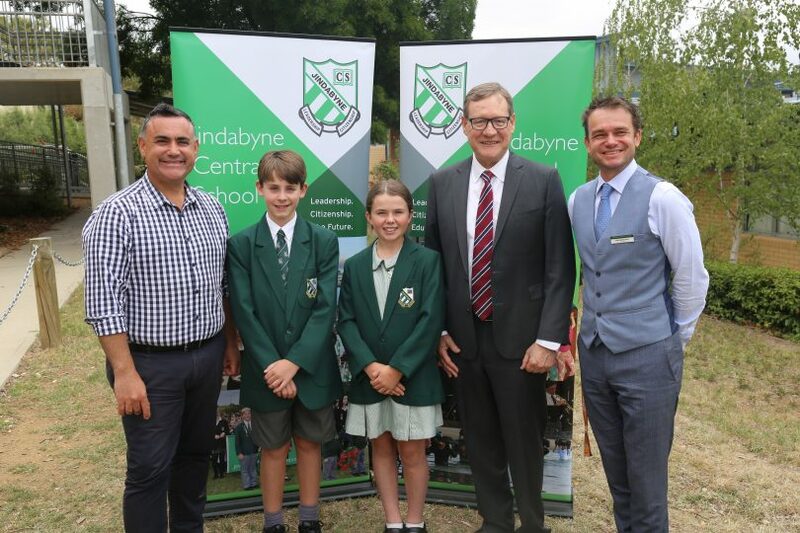 The Member for Monaro John Barilaro, Jindabyne Central School Junior Captains, SMRC Mayor John Rooney and JCS Principal Felix Bachmann announcing Jindabyne’s new joint school and community library. Photo: Supplied. In February he announced that Tourism Snowy Mountains was successful in its application for $100,000 and that the Snowy Alpine Heritage Association will receive $95,000. Other recent funding announcements include the $18.6 million Cooma Hospital Redevelopment, $750,000 for major upgrades to sporting facilities across the region, and $100,000 to install an inclusive flying fox at Banjo Paterson Park in Jindabyne. Labor Candidate for Monaro Byrce Wilson said he supports the Jindabyne Masterplan and will have more to say over the next couple of weeks. “We don’t think a TAFE in Jindabyne is a good idea though, as it will erode Cooma TAFE,” he told Region Media. 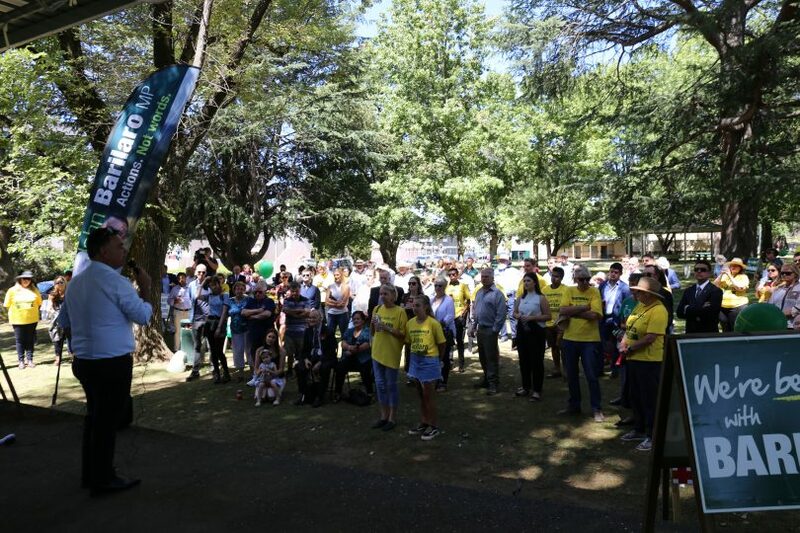 Mr Barilaro launched his official election campaign in Queanbeyan on Sunday, vowing to continue his strong record of delivery for the communities of the Monaro. However, in the lead up to the election, Mr Barilaro has removed the National Party logo and branding from his personal website, Facebook and from letters to constituents. Labor spokesperson, Ryan Park challenged John Barilaro to either put the Nationals logo on his campaign material or resign as the party leader. Mr Barilaro launches his campaign for the March State election in Queanbeyan on Sunday.